Yesterday marked our first home delivery of organic produce for this season. A few years ago my neighbor Alison approached me about splitting a harvest share in a Community Supported Agriculture (CSA) farm. CSAs are found throughout the country. How it works is that community members purchase, in advance, a share of the farm’s harvest. Thus, the farmer gets money ahead of time to put towards growing the crops. When the crops are harvested, the farmer puts them aside for the CSA members. Any additional crops are sold through other avenues like farmers’ markets, restaurants, and grocery stores. Our CSA is with a local organic farm that offers 28 weeks of home delivery of a “standard size” box of vegetables for $714. We could pay slightly less to pick up the box at the farmers’ market, but home delivery is definitely worth a few extra bucks a week for us. Alison and I split a box which still leaves us with plenty of vegetables each week. In fact, sometimes we have more than we can eat. We each pay $357 for the season which comes to $12.75 a week for vegetables. We might be able to get a better deal each week at the farmers’ market, but in the years that I haven’t subscribed to a CSA, I find that I don’t always make it to the farmers’ market and therefore I end up buying our produce at the grocery store where organic vegetables tend to be very expensive. Also, the vegetables that arrive in our box are harvested within the previous 24 hours which is certainly not the case at the grocery store. I like the idea that we’re supporting a specific farm when we subscribe to a CSA. Many farms offer their CSA members little perks like special invitations to come tour the farm. Each week we receive a newsletter via email from the farmer telling us what vegetables to expect in the box. In past years, there have definitely been times that we get vegetables I’ve never tried before. Last summer we seemed to get week after week of Chinese eggplant. While Mark never became a fan of the eggplant, I ended up loving it. Splitting the weekly box with Alison means that if produce items arrive that one of us doesn’t like, we can swap with each other for something we do like. Usually, however, we just split the items in two (that is, we’ll each take a head of lettuce if they deliver two); sometimes we’ll literally cut something in half. The other nice thing about splitting the box with Alison is that it guarantees I see her once a week. Like so many people, we have busy lives and it’s good to have an opportunity to check in with each other once a week. We also get to swap stories of how we cooked the vegetables from the previous week. 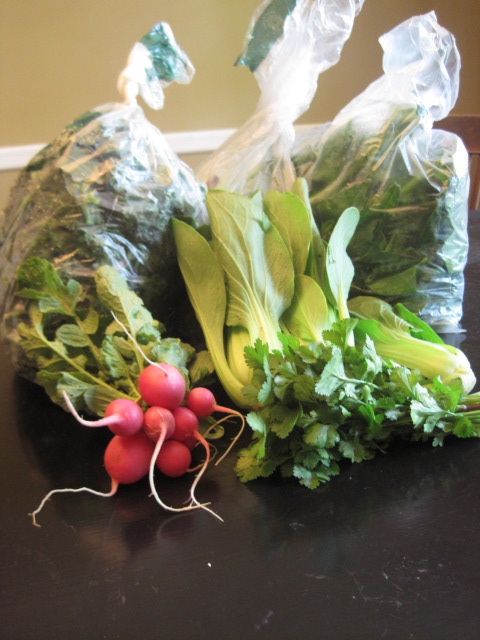 Yesterday’s delivery box contained radishes, cilantro, three heads of baby bok choy, and a large bag each of spinach, salad greens, and a mixture of kale and collard greens. This week’s newsletter email from the CSA farmer said that in the early weeks of the season the amounts in the boxes will be smaller than later in the season; the variety and volume of harvested crops will increase throughout the summer. However, even splitting the box, Alison and I each got a nice amount of vegetables this week. I looked online at our CSA’s harvest chart which notes that for the remainder of this month we can expect our delivery boxes to include arugula, beets, kale, mizuna, radishes, salad greens, and spinach. Hmm, mizuna. Never heard of it. This website describes it as, “one of those strange oriental vegetables which arrived in the West in the last 20 years or so.” The website goes on to say that mizuna greens may be added to salads and soups. Alrighty then. Will do. Yesterday, I made a quick stir fry with some of the baby bok choy from the CSA. 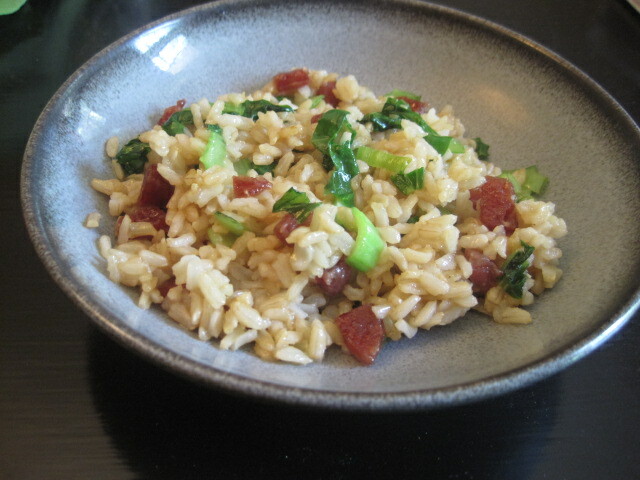 I sautéed it with garlic, a Chinese sausage I had in the freezer, and some leftover brown rice. Yum. I did have to give the baby bok choy a thorough washing though; it still had lots of organic soil tucked in its crevices. If you’re interested in joining a CSA farm near you, check out Local Harvest which lets you search for CSAs by zip code. Though many farms in our area sell out of shares before the growing season even begins, there are still some (like the one we subscribe to) that are offering memberships.